On GDP figures today, credibility, and Popperian falsifiability..
Much of the discussion about today's GDP figures has focused on the "surprise" fall in construction, as if this had somehow come out of nowhere and was nothing to do with government policy. And perhaps the figures will be revised. But more broadly, it is hardly surprising that the construction industry is having a hard time when the government has taken a deliberate decision to slash public sector investment - down 25% last year, as Tuesday's ONS figures showed. In fact, virtually all last year's deficit reduction came from investment cuts; the current (non-investment) deficit hardly changed. Who wants to tax and spend? the IMF, that's who. "the debate on work experience seemed almost entirely divorced from the evidence of whether work experience actually improved the employment opportunities of jobless young people. " "DWP [the Department for Work and Pensions] should attempt to produce a proper counterfactual analysis that would allow us to come to a considered judgement on the programme's success. " DWP has now done just that, publishing today an impact assessment of the Work Experience programme. The analysis compares participants on the work experience programme with "comparable" (as determined by sophisticated statistical techniques) non-participants. 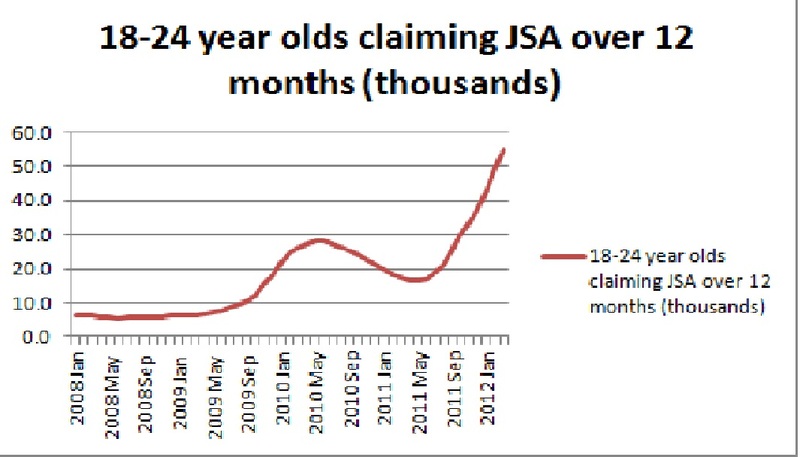 Stuck on the dole: why has long-term JSA receipt among young people tripled in less than a year? As recently as 2008 there were fewer than 6,000 18-24 year olds who had been on Jobseekers' Allowance for more than a year. That number is now 55,000 - nearly ten times as many. This is not just the recession and its aftermath: after falling back somewhat in the year to May 2011, the number has more than tripled, as shown in the chart below. 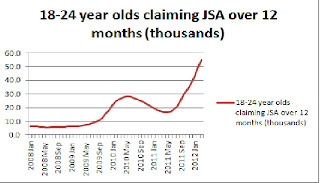 The same is true for the proportion of claimants who have been claiming for more than a year. “The Spanish government is taking the necessary steps which will contribute to help calm the markets”. "Investors fear that tough new austerity and economic reform programmes in Spain and Italy could hold back growth, undermining the ability of these countries to reduce debt levels. " The arithmetic of this is set out in Andres and Domenech's contribution to the Vox debate: see also my contribution, and that of Brad DeLong. The economic policies of the European Commission of the last two years have been mistaken. The objective of reducing Spain's deficit by 4% of GDP is absurd and unrealistic. Just after the last UK election, Sr. Rajoy told El Pais "El plan de Cameron da confianza; yo haría algo similar en España". [The Cameron plan has given confidence; I will do something similar in Spain]. In doing so he was following the fleeting intellectual fashion of the time, that somehow accelerated fiscal consolidation would restore “confidence” and hence growth. My contribution to the VoxEU debate "Has austerity gone too far?" is here. Since it is in large part a critique of Giancarlo Corsetti's piece here, best to read that first. Briefly, I argue that Corsetti's article is misleading, and, if taken seriously by policymakers, potentially damaging, for three reasons. First, it fails to distinguish between eurozone countries and those that have monetary sovereignty, for which these tradeoffs, at least in this form, simply don’t apply. Second, it fails, for the former, to correctly identify the source of sovereign risk, and hence risks prescribing policies that will be ineffective if not damaging. And third, it treats individual countries as if they were making independent policy decisions –when, of course, this crisis is a eurozone crisis and needs to be addressed as such. Long term interest rates and confidence, continued.. 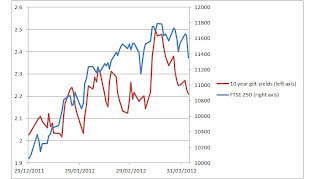 The chart shows the value of the FTSE-250 (a somewhat better reflection of the UK corporate sector than the heavily international FTSE-100) against 10 year gilt yields. 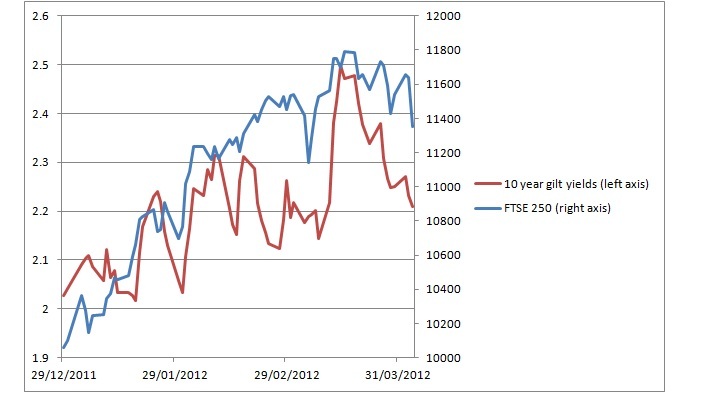 The correlation is pretty obvious; higher equity prices have gone along with higher long-term interest rates. Both reflect the fact that, since the turn of the year, the economic news has been better, with business confidence clearly improving, even it is yet to show through in the official data. "Either you believe that we are going to return to normal economic growth reasonably soon or you believe that gilt yields should be very low, but you cannot believe both. If you believe that economic prospects are reasonably good, the current level of gilt yields just does not add up." The markets agree. Will the government and other commentators finally recognise the overwhelming evidence, both theoretical and empirical? I'm not holding my breath. Last week representatives of the European Commission came to see me and colleagues at NIESR to discuss the economic prospects for the UK. We had a sensible discussion, during which time I expressed my view that slowing fiscal consolidation would boost growth and employment without posing any significant risk to fiscal credibility, and that in this respect the Budget was a missed opportunity. When I made this point, the head of the delegation said that they had seen the ratings agency Fitch that morning, who took a different view.